Healthy living is dependent on healthy breakfast. Breakfast is the most crucial component of healthy living. Skip the breakfast and you not only spoil the healthy start for the day but your whole day would be dull. Breakfast is the most important meal of the day. It should be heaviest compared to other meals. Plus it should be full of proteins and essential fats. It should be less in sugar. Not having breakfast means there is a difference of almost 14-15 hours between two meals i.e. last day's dinner and next day's lunch. 2) It reduces the concentration at work. If you skip the breakfast regularly, it makes a body less effective & productive at work. 3) Many a times, people who skip breakfast feels lazy. This encourages people to go for tea or coffee. Having a tea or coffee on an empty stomach increase a sugar level and makes it difficult for the next meal to digest very slowly. 4) If you eat more during the rest of the day while skipping breakfast, you are highly nominated for weight gain and that is a precursor to heart disease and many other serious health conditions. So have a breakfast regularly and very early in the morning. 1) Oatmeal : Oatmeal are rich in fibres and anti-oxidants which are most essential part of breakfast. The more the fibre content, less are the chances of heart problems since rich fiber intake helps body to burn bad cholesterol. Generally, intake of oats with milk or water without sugar is considered as the healthiest. Also, my nutritionist says it's important to get protein within 30 minutes of waking up. 2) Green Tea : The best time to consume green tea is on an empty stomach in the morning and once in the evening. This power drink is also packed with antioxidants, which will help your skin look younger and healthier overall. It improves digestive system. Find out more on Green Tea, Green Tea Benefits. 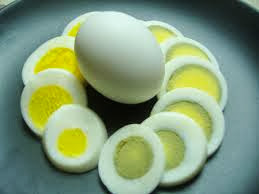 3) Eggs : Be it any day of the week, breakfast must include atleast a single boiled egg. Rich in protein plus the required fats that are most required at the start of the day. They are much higher in all-important omega-3 fatty acids, shown to benefit everything from your mental health to your heart health. 4) Fruit Salad : Another most crucial component of breakfast, fruits. Be it orange, banana, apple, strawberry it has to be included in a morning meal. Atleast have two types of fruits with eggs. They benefit the most on an empty stomach. Find out more on fruits, How to eat fruits the right way?. 5) Dry fruits : Have a single piece of cashew nut, almond, pista, etc. of each dryfruit. They are enriched with protein plus the non harfful cholesterol. They are sugar free and so can easily be consumed without affecting the sugar levels. Also it provides you with sufficient nutrients to make a complete day productive. 5) Milk : Have a glass of milk before you leave for work or school. Don't skip this at all. Milk is most important of all. Do not take the risk by skipping this. Milk is all filled up with natural anti oxidants plus healthy fats. It is enriched with natural fats that improves the digestive system plus reduce the risk of heart diseases.